What are you doing to reach your weight loss and health goals? Are you going to join a health club, start walking every day, pop in a dvd exercise tape and get to work or maybe borrow the kids Wii or Xbox 360 and use that to get fit? Whatever you decide to do, the most important thing you can do is something. Just do something! Get off the couch, get out of your chair and get some nice healthy exercise. If you are looking to improve your health and lose some weight as well, you really should consider adding a High Antioxidant Meal Replacement Shake made with Chocolate. Healthy for you and helps you lose weight too. I enjoy my “Chocolate Diet” shake every morning and most days for lunch as well. Current Chocolate Diet Promo for the month of January: Pay just $59.99 SHIPPED for the Chocolate Diet! This awesome deal does not require a coupon code or a promo code. All you have to do is click to order one or more of the XO Meal Replacement Shake. If you would like a printable version of all of my yummy shake recipes, just send me an email and I will get it to you right away. 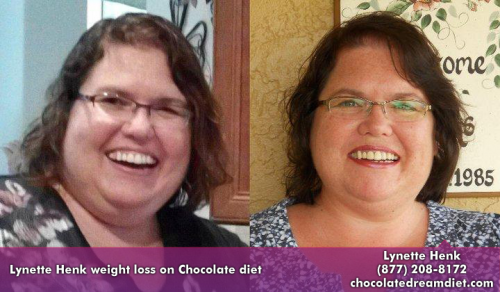 You can reach Lynette Henk at 941-216-5727, lynette @ liveforchocolate.com or visit her website at ColdPressedCocoa.com. Trust me, If I can lose the weight you can too. Join me and lets lose the weight together!! WTG….Lynette…I’m pulling for you. You can do this…I KNOW it!!!!! !